Try our corporate Limousine service. 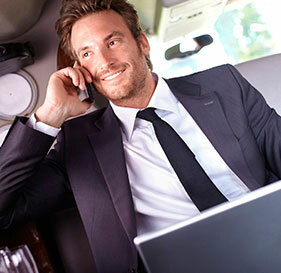 We offer several Limousine services for corporate and business needs. travel from hotels to meetings to the office, whatever you need, we'll make sure it happens. We work to your needs. We can do an Airport pickup then take you to your Hotel, re-pickup for a Business Meeting at your office and then a re-pickup back to your Hotel. Whatever your needs, we will make it work. We understand that time is of the essence and we will do whatever you need to make your plans a reality. We now offer Door to Door direct Airport Service and Shuttle Packages. We will make sure upon Arrival & Departure that you or your customers are completely taken care of right from our first "Hello". Airport Pickup directly at your closest Gate ( Terminal 1: Pillar "B", Terminal 2: Pillar #29 ). We take all the guesswork out of your travel experience. We will give you written instructions for your procedure. Pricing will vary depending on your needs and itinerary.